St James's Palace, located only a short distance from Buckingham Palace remains the official home of the Monarchy (as it is officially the Court of St. James) yet is only used for the occasional reception and houses many offices and apartments. Does anyone know why it is still the official home of the monarchy and if there is any public access to the Chapel Royal and Reception Rooms? Saying the "Court of St. James" sounds a lot more classy and refined than saying the "Court of Buckingham!" Posts about the cost of the royal family have been moved to the Royal Finances thread. Are St James Palace and Clarence House physically connected? Yes Clarence House stands beside St James' and it shares the palace gardens. God Save the Queen! Advance Australia Fair! Good point. I think the sense of 'mystique' that surrounds some aspects of the monarchy is one of its strengths. Does anyone have a picture of the whole palace? I've seen pictures of Clarence House (the part that's painted white) and a small part of St. James Palace, but never an outside shot of the whole thing. As you can see it is a fairly large and rambling collection of buildings and thus difficult or impossible to photograph in one shot unless from the air. I have to say looking at this picture St. James isn't a very "pretty" palace. And it looks like it might be one of the oldest. Maybe they're just not able to refurbish the outside because it's all brick. Personally I think Buckingham Palace looks much nicer. The white building to the left is part of the Queen's Chapel on the linking road between St. James's Street and The Mall, called Marlborough Road. Be honest, I never like St James Palace. It look nothing special outside. This is going to be tricky to explain, but hopefully I will make sense! 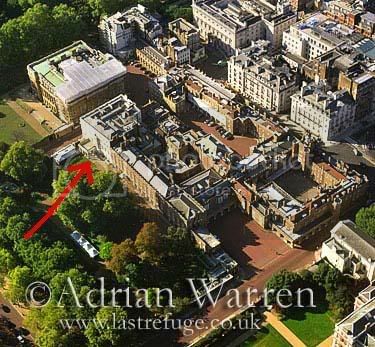 In the aerial photo of St. James Palace there is a large square portion of the palace to the lower left with its own courtyard. It appears that the clock tower with sentries is on the upper right side of this portion of the palace. Is this correct? On the top of the L portion on the upper left, it appears that this portion ends in a large white rather than red brick section. Is that Clarence House? Or, just above this is another large white building with a roof that is partially green and partially glass looking. Is that Clarence House? If Clarence House is the former then it is defintely physically part of St. James' Palace. If it is the later then it simply stands rather near the palace but is not physically part of the palace. Oh, I justed noticed that the "L" section on the upper right leads to another portion of the palace. This portion seems to have a large square or rectangular building on the right and this portion also seems to end in a large white building. Is that Clarence House? Sorry to be confusing if I am. Thanks, Warren. So it really is part of St James' Palace. What is the large building just above to the left? So it houses some of the Royal Family? Is it Princess Beatrice, Prince William and Prince Harry? I thought everyone who had a London spot lived in BP. What is the large building just above to the left? Queen Victoria is said to have remarked to the Duchess of Sutherland on arriving at Stafford [Lancaster] House, "I have come from my House to your Palace." picture from Wikipedia Commons, public domain. I don't think the Princess Beatrice and Princess Eugenie have private residences in London. They probably have some privacy in the huge house in Windsor owned by their father. Prince Andrew's London residence is in Buckingham Palace. They probably have bedrooms as part of their fathers home there. Princes William and Harry live in Clarence House, but it's a big place (over and acre of square footage). They probably have private entrances.